sleeping Lucy . . . . 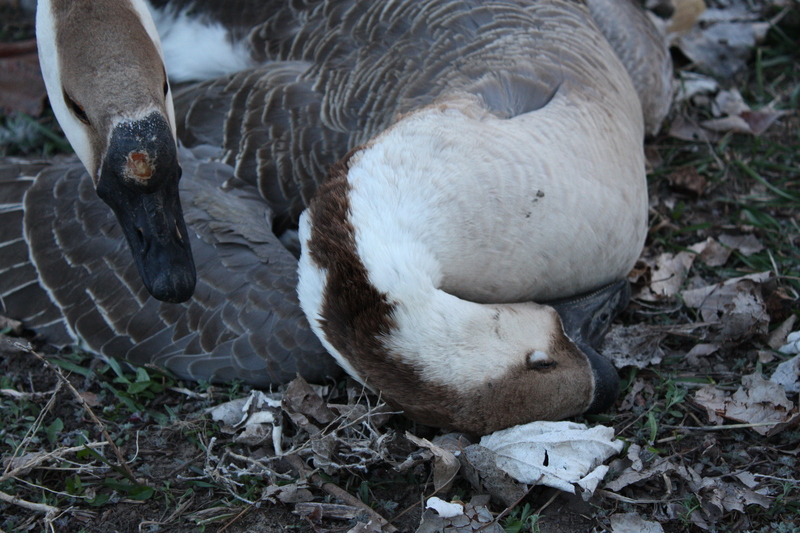 Gathering the geese in the evening is a daily ritual that recently led to a heartbreaking discovery. Lucy, the smallest of the four young ones I raised in the house, was laying next to the fence with her head resting on the ground. Fred, the elder gander who fathered Lucy was hovering over her, stroking her softly with his beak and wailing in a mournful crying lament that brought me to tears. As I tried to approach her, Fred hovered over her, spreading his wings to protect her. grieving . . . .
Lucy had shown some signs of distress on a previous occasion, but she seemed to snap back and was behaving normally for several days following the event. We had noted dissension among our gaggle of five geese, with lots of squawking and honking as the three males tried to assert their dominance. Springtime brings on nature’s call of the wild to procreate and competition becomes the order of the day. Poor Fred had been demoted from top gander to just a guy hanging out on the fringe and it appeared to us Lucy took pity on him. She was the smartest, gentlest of the young geese and seemed to radiate a motherly concern for Fred when Ricky and McGill drove him away. Ethel, his mate seemed to have abandoned him, however she may have had little choice in the matter. farewell . . . . I gathered Lucy in my arms and carried her to a small shed where she would be secure for the night. It was growing dark and in my grief I couldn’t think of anything else to do for her. Early the next morning Michael carried her up to cemetery hill where all our other pets have gone to rest. 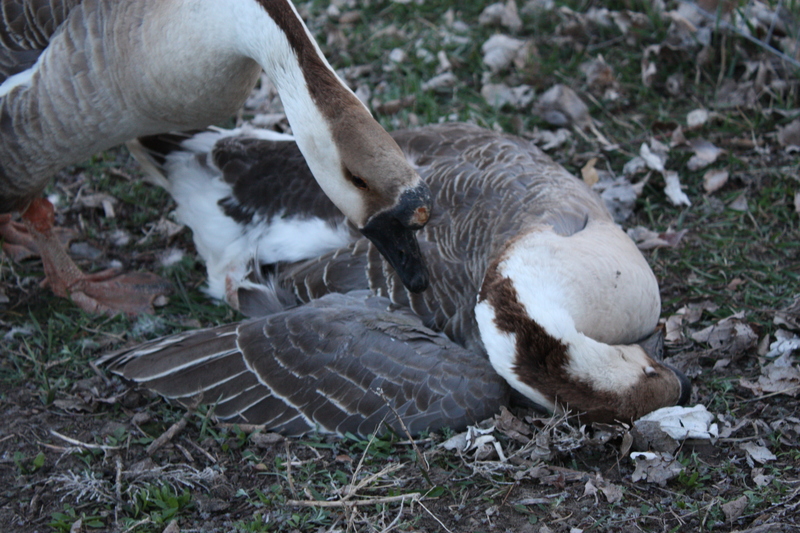 As he dug her grave, two pairs of Canadian geese flew low overhead from the pond, calling out as if to tell Lucy goodbye. He was very moved by this seeming coincidence. 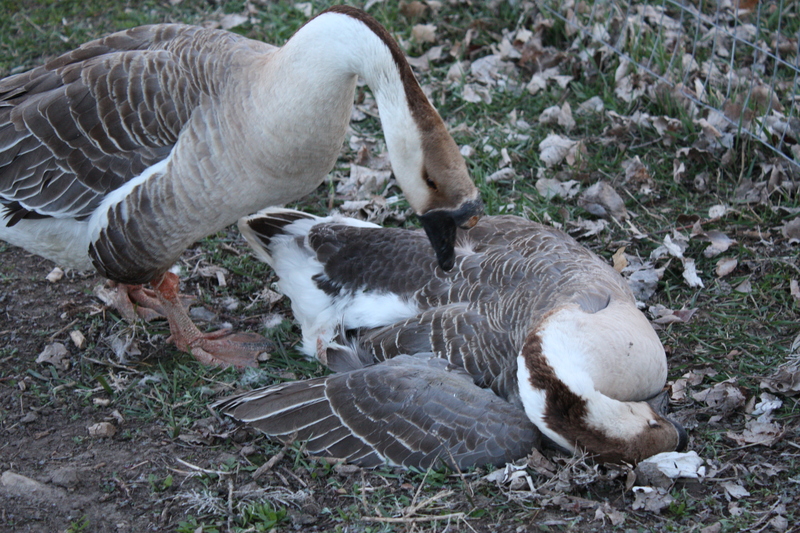 We have now lost both of our young female geese. Esme’ disappeared last fall while trying to nest out in the Poplar patch away from protection at night. We found no trace of her. We have done our best to care for these creatures who came into our world so serendipitously. I have agonized over Lucy’s death, and wonder if we could have prevented it. She brought me great joy, and as I look back at the photos I took of the four little goslings who lived in the laundry room (January 2012) I am grateful for the time we shared with her.